In terms of name value in the matches, Smackdown certainly delivered this week with a number of matches that could’ve fitted easily onto a PPV event. This was mainly down to the All-Stars Money in the Bank Ladder Match and with the Money in the Bank PPV just two days away this was WWE’s last chance to get major buys for the show. Now it seems an age since these two were completely torn apart by a New Jersey crowd on the Raw after Wrestlemania. The reason behind this was not only some poor WWE booking involving the WWE App, but also because Orton and Sheamus were two of the stalest characters that WWE was presenting on television at the time. Now, since then not a lot has changed for either Sheamus or Randy Orton. Orton has fared the better out of the two, featuring in a story involving The Sheild, Daniel Bryan and Kane, that was the highlight of both Raw and Smackdown for a number of weeks. Orton has certainly stepped up his game, bringing a hell of a lot more passion to his performances than we had seen pre-Wrestlemania. I’d say this is mainly down to Orton enjoying the storyline and being put against some top talents in marquee matches, but Orton can not simply choose to deliver a performance when he is enjoying himself, if he wants to stay at top star in WWE he needs to take the rough with the smooth. Sheamus on the other hand has not done particularly, he had a decent series of match with Damien Sandow, but the rivalry surrounding it was mainly full of awful segments, that Sheamus didn’t particularly take too. His comedy is at times painful to watch, which is a shame because we’ve seen Sheamus deliver some great performances when he keeps it serious. In the build for this we had a backstage interview with Sheamus conducted by Renee Young. Sheamus basically went over old ground with Randy Orton, by mentioning Saint Patrick and the snakes story which we hear pretty much every time these two face off. We then got Sheamus talking about what he’d put in the Money in the Briefcase if he won it, including “corn beef and cabbage”. It particularly help to build either match, as it didn’t look like Sheamus was taking it seriously, so why should an audience take it seriously either? I’m not saying comedy can’t factor into main event storylines, because it can and has worked well before, but Sheamus’ new Irish stereotype character certainly doesn’t make me laugh, so the comedy feels out of place. Sheamus finished up by telling Renee Young she was “pretty cute”. Will this go anywhere? Most probably not. The match started off pretty hot with some good work on the outside, with use of the announce table and steel steps, unfortunately an Orton back suplex onto the barricade was confined to the WWE App. We then entered a regular Orton match pattern, with a number of head locks and rest holds, I understand Orton used a headlock when heel to build for a comeback from the face, but when Orton himself has operated as a face he has certainly been over reliant on that move. A nice section of the match saw a play on each man’s signature comebacks, with Orton no-selling a Sheamus high knee, a la Davey Richards, before launching into a comeback of his own. It was a good play on moves we’ve seen before and certainly picked up the pace of the match. We got a number of other variations of Sheamus and Orton’s signatures move, with Orton doing some great selling of Sheamus’ clubbering on the outside, before hitting his signature Rope Hung DDT from the corner. The end saw Orton and Sheamus battling it out on the top rope, before they both took a spill to the outside. Daniel Bryan came to ring, and got a ladder from under the ring, taking out both Sheamus and Orton before ascending the ladder. Christian then came down and all four men attempted to climb the ladder to get the briefcase in various combinations. It wasn’t a bad way to end the show and gave fans a quick preview of the Money in the Bank Ladder Match, but I can’t help but think it suffered from not having CM Punk involved. Eventually after an RKO to Bryan, Orton scaled the ladder to collect the briefcase for the end of the show. I’ve enjoyed the booking heading into the Money in the Bank All-Stars Match, with a number of guys like Orton, Bryan, Punk and Van Dam heading into the match looking like having a strong chance of picking up the victory. The other match pitching Money in the Bank All Star competitors against each other saw Daniel Bryan take on Christian. Both have been booked quite differently heading into the contest, with Bryan currently part of a major push, picking up victories over Randy Orton and Sheamus in the last few weeks, whilst Christian seems a little lost after his return to WWE last month, with pinfall losses to Orton and Kane. Christian’s return certainly hasn’t been handled as well as it could have, after the first few weeks of picking up wins over the likes of Wade Barrett and Drew McIntyre, as well as an impressive victory with The Usos over The Shield, the wheels seem to have come off Christian and his momemtum has slowed pretty quickly, which is a shame as he could be a vital asset to WWE who they seem to be wasting. Christian proved his worth to WWE with this match against Bryan as the two put on a good bout to open the show. Using the face vs. face dynamic to their advantage neither Bryan or Christian spent a prolonged period in control of the match meaning we got to see some fast paced action with a ton of reversals thrown in. Both men had outside dive attempts thwarted, including Christian delivering a hard slap as Bryan was about to fly. The two also brought everything they could to match, which always makes it a lot easier to watch than when someone is simply phoning in a performance, with Bryan delivering a nice basement dropkick with Christian propped against the steel steps a particular highlight. The match was upped a notch with a near fall for Christian with a Spear out of nowhere that actually made me believe that Christian could be picking up the victory heading in to Money in the Bank, mainly due to Bryan ability to kick out late, and some good commentary from Michael Cole. The end saw Christian attempt to use his signature sunset flip whilst boucing out of the corner, only for Bryan to lock in the No Lock for the submission victory. It was a good ending that was worked well by both Bryan and Christian with Christian’s selling of the No Lock really helping to get the moment over for me. Heading into the Money in the Bank All-Stars Match, Bryan would surely have to be one of the favourites to pick up the win, not only have we seen him beat Orton, Sheamus and Christian on Raw and Smackdown in the last few week, but he even un hooked the briefcase Monday Night on Raw. Bryan would be a great choice to get the briefcase and really deserves a WWE Championship run, but I can’t help thinking that he doesn’t really need the briefcase to do so and the moment would be a lot of impressive without it. Christian seems to be in the match to simply make up the numbers and take some bumps, which is a shame as I think Christian can offer a lot more for WWE. Having him lose everyone of his warm up matches hasn’t exactly built him up well heading into the PPV, even if Christian has put a lot of effort into those matches. Elsewhere, the rivalry between Dolph Ziggler and World Heavyweight Champion Alberto Del Rio continued. With Teddy Long telling Dolph Ziggler to take the night off, because Long didn’t want Ziggler to interfere in Del Rio’s match with Sin Cara later on and end up going the same way as Vickie Guerrero. It’s strange for Long to compare himself to Vickie, when the actual General Manager of Smackdown is still Booker T, I really hope they aren’t building to some kind of power struggle between Booker and Teddy, as we’ve got enough of that going on with The McMahons on Raw, and I actually quite like the Booker and Teddy pairing. As Del Rio waited in the ring, Sin Cara headed down to ring looking more defined than ever, he had also apparently grown a fair bit taller as well. Instead of executing his signature entrance, Sin Cara headed straight for Del Rio, eventually hitting a Zig Zag to take out the Mexican Aristocrat. Yes, a Zig Zag. Of course, it was Dolph Ziggler who even got a few signature taunts in for good measure. It was a nice segment and was enjoyable to watch, but didn’t feel like a great way to finally sell this match heading into Money in the Bank. Teddy Long caught up with Sin Cara backstage, cautioning who he thought was Ziggler for his actions, until Ziggler himself turned up explaining he left his phone in the locker room. I liked this little addition and Ziggler is really settling into to the new face role now. 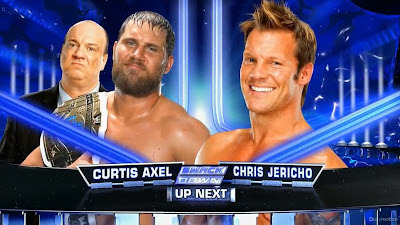 Elsewhere, Chris Jericho had another match against Intercontinental Champion Curtis Axel, as always accompanied by Paul Heyman. It was another solid encounter between these two, with Jericho doing a good job of controlling the match and allowing Axel to look good with a number of near falls and kick outs by each man. I’m still blown away by the kinds of moves Jericho can do convincingly at the age of 42, like a fantastic cross body that men a lot younger than he would struggle to pull off as well. The end saw Jericho hit a Codebreaker on the Intercontinental Champion who fell to the outside of the ring and was unable to make the ten count, handing Jericho a victory. To me, this ending didn’t make a lot of sense, with Jericho picking up another win over Axel, but Axel vs. Jericho isn’t the Intercontinental Championship match at Money in the Bank, it’s Axel vs. The Miz! There was also the first ever Diva’s contract signing, in what was another impressive segment for AJ Lee and Kaitlyn. With AJ saying if Kaitlyn signed the contract she had even more to reveal about her, things got really heated after Kaitlyn signed the contract and AJ revealed texts that Kaitlyn had sent her secret admirer, also known as Big E Langston. With AJ revealing things Kaitlyn had said about Natalya and The Funkadactyls, Kaitlyn was clearly about to lose a lot of friends, which definitely brought that crazy side back of Kaitlyn, as with probably her best work on the mic so far, she came back at AJ. Kaitlyn said the trigger word for AJ “crazy” and got a slap for her trouble, with Kaitlyn retaliating by pushing AJ in to the corner using the table and continuing to attack her until Big E Langston pulled her away. Kaitlyn then had a slap for Big E. I actually really liked this contract signing, as it took a main event style segment and used it to elevate this Diva’s rivalry into feeling important, both Diva’s have put in a lot of work to this rivalry, which has been refreshing to see and hopefully it pays off at Money in the Bank. There was also some build for the World Heavyweight Championship Money in the Bank Ladder Match, with Fandango facing off with Wade Barrett, in a nice follow up from the segment on Raw that saw Fandango get a Bullhamer elbow from Barrett. Most of the match was dominated by Team Rhodes Scholars and Zeb Colter’s Antonio Cesaro and Jack Swagger being at ringside, whilst Barrett and Fandango simply went through the motions, with the Preston man dominating. Barrett got distracted by the argument between the two teams, allowing Fandango to hit Barrett with a kick to the head and get the pinfall victory. This Money in the Bank certainly hasn’t had as much build up as the All-Stars one, but with the talent involved in the ring, and a lot of inter-weaving character work gone into the story, it’s probably the match I’m most excited to see. Tag Team Champion Seth Rollins of The Shield was also in action against Jey Uso, both with their respective tag team partner at ringside for the contest. I was impressed once again with these two, with Jey proving he is more than capable of putting on a good singles match. The match saw Rollins take control early on, before the highlight of the match for me, saw some classic no-selling from Jey, as he took chops from Rollins, only to shout out the call and response US-O with the crowd happy to join in. Uso was then on a roll hitting a number signature moves, before heading to the top rope. With Jey attempting to warn his twin, Jimmy, of an impending clothesline from Roman Reigns, this was the opening Seth Rollins needed, knocking Jey off the top rope and hitting the Blackout for the victory. It was a well worked singles contest, that used the involvement of their partners well, thus helping to build for Money in the Bank, although I can’t help suggesting that giving Jey the victory here would have helped to make The Usos look like much more of a threat to the Tag Team Champions at Money in the Bank Kick-Off. In a reverse of the Jericho-Axel match we saw earlier, Ryback faced The Miz in another rematch. Miz already held a victory over Ryback from two weeks ago on Raw, after Ryback had had the match stopped by the referee for an injured knee. This was capitilsed upon well in this match, with Miz spending a lot of the match focusing of Ryback’s knee. With Ryback, using the referee to help himself up, he suckered Miz in for a Meathook clothesline followed by a Shellshock for the pinfall victory. This was a much better match than I had expected, using a good deal of psycology and story which helped propel the mediocre action that occurred in the ring. I’m actually enjoying this development to Ryback’s character as after WWE botched both Ryback’s face push and initial heel turn, there is only so long you can believe that Ryback is an all concurring monster. Vickie Guerrero also made an appearance on Smackdown this week, claiming Teddy Long had made her by a ticket and paraphrasing Stephanie McMahon from Raw, calling him a “spineless puppet”. Vickie went on to rip up her ticket, before Teddy had her removed from ringside. I’m not quite sure where this segment is heading or even if it will be mentioned again, but one thing is for sure we haven’t seen the last of Vickie Guerrero. What have I learnt from this week's Smackdown? 1. Randy Orton, Daniel Bryan, CM Punk and Rob Van Dam are the most likely to claim the Money in the Bank briefcase. 2. Christian has been poorly utilised during his return and looks the least likely to win the breifcase. 3. Dolph Ziggler looks to have finally settled into his role as a face.